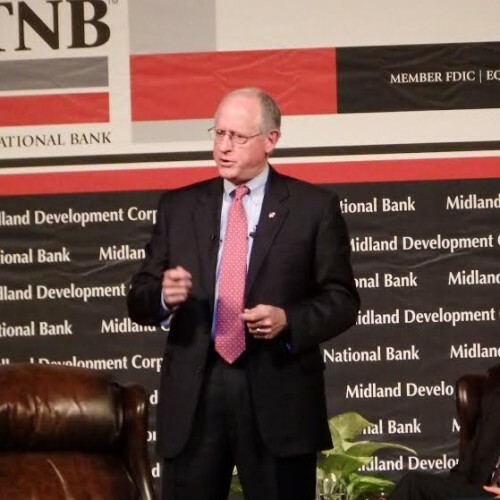 The Midland Chamber of Commerce and the Midland Development Corporation hosted a conversation with U.S. Rep. Mike Conaway for the annual “State of the Economy” forum on Thursday. Conaway laid out his views on a number of economic issues, ranging from the ways oil and gas production has helped rebound the economy in Texas, to how the Keystone XL pipeline would affect the Permian Basin. He also offered his views on President Obama’s push to raise the federal minimum wage. Conaway said local businesses would be hurt by an increase to the minimum wage – that they wouldn’t be able to absorb the cost of paying workers more, and wouldn’t be able to offer the same amount of work as they currently do. Despite those warnings, Conaway suggested a raise to the minimum wage would in reality not have that big of an impact locally in the Permian Basin. “I suspect there’s not a lot of folks out there that are starting those entry-level jobs at a minimum wage,” he said. The latest data from the Bureau of Labor Statistics show the median hourly wage in Midland at $17.43, and in Odessa at $16.52. Conaway also delved into what he described as a public misperception of how government energy subsidies work. He described “subsidies” as an “inflammatory” word, and said he’s worked to change perceptions in Congress and in the general public that the industry relies heavily on government support. This entry was posted in KRTS News and tagged 11th District of Texas, Economy, Energy, Mike Conaway, Minimum Wage Debate, Obama Administration, Oil and Gas Industry, Permian Basin, Private Sector, Texas Economy, Texas Politics. Bookmark the permalink.